Five samples were tasted for differences in bitterness. Recently, Beer and Wine Journal (BWJ) and Basic Brewing Radio (BBR) teamed up for a collaborative experiment. One recent idea to catch the attention of homebrewers is that the chloride to sulfate ratio in their brewing water affected their perception of hop character (particularly bitterness). Beers with more chloride ions than sulfate ions were supposed to taste more sweet or feel full-bodied, to the detriment of the hops. Beers with more sulfate than chloride were said to be drier, accentuating the hop bitterness. For more on this, see our article in the pale, hoppy beer series. We decided to try to test this, but in a way that didn’t require us to brew batch after batch of beer. We hit on the idea of adding minerals to the beer at bottling, instead of to the brewing liquor on brewday. We didn’t know if that would work, but that’s what science is all about — finding out for yourself. 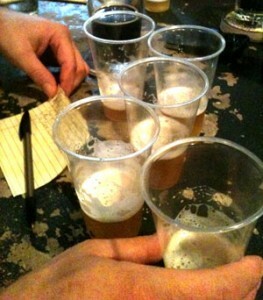 In the end, we designed an experiment that yielded 5 beers, each with chloride levels of 50 ppm from the brewing liquor. The five beers had roughly 50, 100, 150, 200 and 250 ppm sulfate ions (from the water and additions at bottling), respectively. This gave them a 1:1, 1:2, 1:3, 1:4 and 1:5 ration of chloride to sulfate, the usual potential range given for hoppy. Note that, in addition to the ratio of ions being different, the absolute amount of sulfate also differed. The details of the experimental design are given here. As designed, our experiment could answer two questions: 1.) can you make mineral additions at bottling or kegging and have these additions affect the flavor of the beer? and 2.) Does either the chloride-to-sulfate ratio or sulfate levels affect the perception of the beer, particularly the perception of the hop character? James brewed a batch of IPA (for our Roswell IPA recipe) and we asked readers of BWJ and listeners to BBR to colaborate with us. Andy Sparks, Ben Mills, and Kort Castleberry (far right) donated their taste buds to the cause. 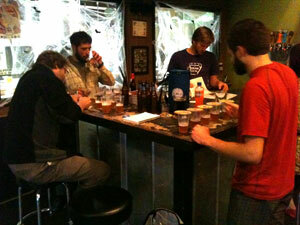 James conducted four local taste panels and sent a set of the five beers to Chris for evaluation. Only one person, Kimberly Johnson, was able to identify the order of the samples from less bitter to more bitter – corresponding to the increasing levels of gypsum. Of the eleven people taking part in the taste panels, seven could clearly identify the beer with most gypsum as seeming the most bitter. However, the ordering of the samples after that was significantly less clear. 1.) Yes, adding minerals when the beer is packaged can affect its character. 2.) Beers that are higher in sulfate (and a low chloride to sulfate ratio) seem more bitter. 3.) Although most tasters could pick out one or more of the beers at the end of the range, few could order the beers in their correct order based on a blind tasting. Palate fatigue is hypothesized to be a factor in this — tasting several hoppy beers in quick succession makes it difficult to detect differences in hop character. In all, although the difference between beers — especially between the extremes of mineral content — were detectable, the difference wasn’t enormous. All 5 beers tasted similar; their hop characters were just altered a bit. For further discussion of the experiment and the results, including interviews with tasters on the taste panels, listen to the November 7, 2013 episode of Basic Brewing Radio. We’re planning on conducting another experiment in early 2014, after the holidays. Let is know if you have any ideas. You can view my video of the tasting results at the link below. Experiment idea: I see a lot of talk on the internet on whether the three Chico strains (WLP001, Wyeast 1056, Safale US-05) perform exactly the same as far as fermentation vigor, flocculation, flavor, attenuation, hop character, mouth feel, etc. A lot of people seems to say they get a peach flavor from US-05 not present in the other two, but I have never noticed it. Much of the information is also contradictory, with some claiming US-05 is less attenuative than WLP001, some claiming more, for example. Perhaps this would make a good experiment, and one that would be fairly easy to control. One wort can be made and split, and all fermentation vessels can be left in the same place. You would need to control somehow for the different initial cell count in the various packages, however. I think there’s something as well with the type of hop. Noble hops in particular seem unusually harsh when used in the presence of high sulfate water. But this is all a matter of perception shaped by a few brews. There’s so many other things that could have contributed to this as well its hard to make the jump that sulfate = harsh noble hops. I wonder if the results would be more obvious in something a little more gentle, like a pale ale. +1 on trying with less hoppy ale, palate fatigue is serious issue with this experiment. Finally it would be interesting to probe further into whether we must focus on absolute sulfate levels or if there is any hope to achieve the desired effect by manipulating the ratio of sulfate to chloride in hoppy beers. This experiment points to a pretty clear effect from increasing absolute levels of sulfate but is less clear on the impact of the sulfate to chloride ratio. Being able to drive a good “sulfate” effect by reducing chloride (altering the ratio) would be a benefit for brewers who wish to minimize overall mineral additions. In my limited experience I’ve generally liked my moderately salted beers more than my more heavily salted beers.